Booker T. Washington, one of America’s most famous conservative educational philosophers, recounts his rise from slavery to establish the Tuskegee Institute, a vocational school for black Americans. Washington begins his autobiography by describing the squalor of his childhood as a slave in Franklin County, VA. On the plantation, Washington was subjected to hard labor every day as a young child and performed tasks like cleaning the yard, bringing water to the slaves in the field, and delivering corn to be milled. The forced labor of Washington’s childhood in slavery came to an end upon Emancipation in 1965, and his mother moved the family to meet her husband (Washington’s stepfather), an escaped slave, in West Virginia. However, the difficulty of Washington’s early life did not end with his Emancipation. Faced with no money, no resources, and no education, Washington was forced to work in the salt-mines at the age of 10. After long days of toil, often starting as early as 4 am, Washington would come home and teach himself how to read using an old copy of a Webster’s “blueback” reader that his mother had given him. Young Washington’s newly gained literacy inspired in him a thirst for education, a thirst that would drive him away from the salt mines and toward the Hampton Institute, a recently established school for black Americans. However, Washington did not have enough money to pay for tuition, so he took a job as a house servant with Mrs. Viola Ruffner, whose husband, General Ruffner, owned the salt furnace and coal mine. It was in Mrs. Ruffner’s house that Washington learned the importance of general organization and cleanliness. With contributions from Mrs. Ruffner, his brother John Washington, and the black community in West Virginia, Washington set out to enroll in the Hampton Institute. But Washington’s enthusiasm was quickly tempered when he ran out of money upon his arrival to the university. With no way to pay tuition, Washington set out to impress the head teacher, Miss Mary F. Mackie, by sweeping out one of the school’s lecture halls. Miss Mackie was so impressed by the thoroughness of Washington’s sweeping job that she immediately granted him admission to the institute and hired him as janitor to provide him with a means to pay his tuition. Washington applied the same work ethic to his education as he did to his position as school janitor, and in the process he attracted the attention of important figures like the school’s benefactor and ex-Union Army General, General Armstrong. General Armstrong was so impressed with Washington’s work ethic and dedication to education that when he was called upon to provide a leader for a new black school in Tuskegee, Alabama, Armstrong immediately called upon Washington. Although located in a crucible of racial tensions in the Deep South, Washington’s development of the Tuskegee Institute as a practical vocational school for black Americans found acceptance from all citizens in the area. The institute provided black Americans with a means by which to develop wealth and find belonging in their respective communities. Simultaneously, Washington believed that the uplift of black Americans was best accomplished by labor, an ideology that confirmed many white Americans’ belief that black Americans were designed to be a subservient laboring class. Although problematic, this approach to education achieved relative racial harmony in the area around Tuskegee. However, the Institute was not without its problems. Washington faced opposition from black students coming to the school in hopes of a formal education, black parents who felt that their children were not receiving a proper classical education, black leaders who felt that Washington’s conservative approach was harmful to the race, white racists who felt than any education of black Americans was a violation of American social code, and deficiencies in fundraising which kept the school with sub-par facilities and resources. Washington claims to have overcome all of these obstacles with his hard work and personal labor for the success of the school. Indeed, the school not only survived, but it thrived under his leadership, increasing in enrollment, facilities, staff, and general reputation. Washington’s career culminated with his infamous “Atlanta Exposition Address,” a short speech given to the Atlanta Exposition in 1895 (with its transcription included in the book). In this address, Washington introduces his “cast down your bucket where you are” parable, in which he encourages African Americans not to strive for social uplift through migration or political action, but rather to find social acceptance through excellence in labor. The speech gained the attention of white leaders like the philanthropist Andrew Carnegie and President Grover Cleveland, who publicly supported Washington and his ideals. Washington ends his narrative with a reflection on his life, particularly his times at Tuskegee, and he suggests that others can find the success that he has found if they apply themselves to a life of hard work and find dignity in labor. Bunzey, Tyler. "Up From Slavery Plot Summary." LitCharts. LitCharts LLC, 7 Sep 2017. Web. 17 Apr 2019. Bunzey, Tyler. "Up From Slavery Plot Summary." LitCharts LLC, September 7, 2017. 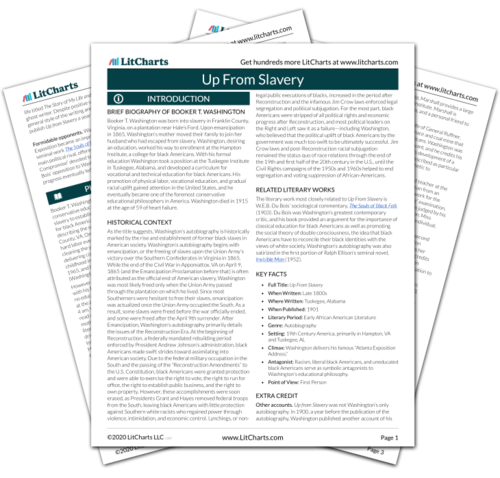 Retrieved April 17, 2019. https://www.litcharts.com/lit/up-from-slavery/summary.